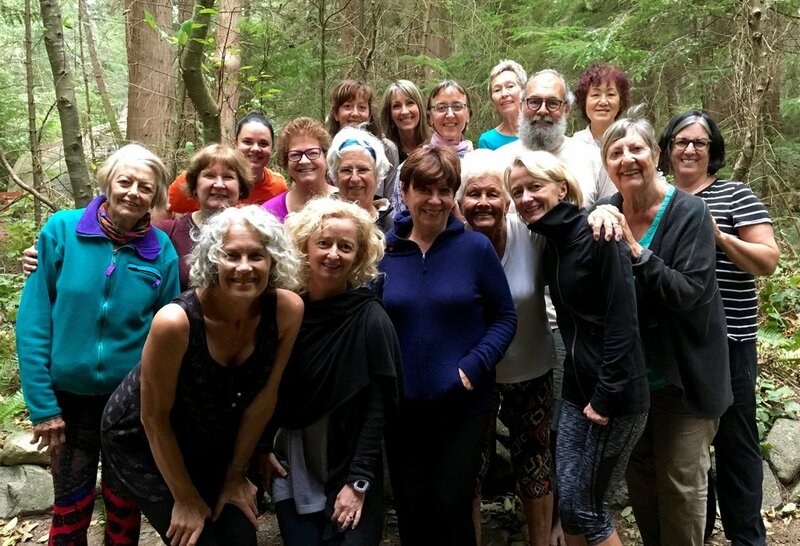 Hollyhock Retreat Center on Cortes Island, BC was founded in 1982 as a center for skill-building and life-long learning. They seek to inspire, nourish and support people whose work serves and educates others in bettering the world. I love the people who come to workshops at Hollyhock – open, curious, positive – the kind of people who make me more optimistic about our society and the world. You can register here or call Hollyhock at 1-800-933-6339 x232 to reserve your spot. We will explore what Thomas Hanna, Ph.D called "“The Myth of Aging.” This is the commonly held belief that limited movement, disability and decrepitude is the inevitable result of aging. In reality, it is the way in which we unconsciously adapt to the physical, psychological and emotional stresses of our lives – the accidents, injuries, surgeries, traumas, adaptive behaviors – that determines whether we will become “creaky and old” or maintain our physical freedom, self-awareness, and independence. Participants will experience why it is time to turn the page on that perspective. A simple daily routine of somatic movements that, when practiced regularly, will relieve chronic pain and maintain freedom of movement for the long-term. The result is more fluid, efficient movement, improved breathing, drastic reduction of functional muscle pain, and improved somatic awareness. Learning [at Hollyhock] is authentic and powerful. The ripple effect far exceeds the physical boundaries of this special place. Here is our updated roster of Essential Somatics® Somatics training opportunities for 2015. Public workshops, appointments for clinical sessions with Martha and on-going classes are on my website. YORK, UK- March 6 - 8, 2015 - Only 1 slot left! DOOR COUNTY, WI - March 20 - 22, 2015 - register now! SOUTH ORANGE, NJ - March 27 - 29, 2015 - register now! CARTERSVILLE, GA - May 1 - 3, 2015 - register now! MELBOURNE (Ocean Grove,Vic. ), AUSTRALIA - November 6 - 8, 2015 - register now! ADELAIDE, SW. AUSTRALIA - December 11 - 13, 2015 - register now! See and hear one of our new SEC coaches describing his experience. Download a complete PDF prospectus of the training. Spend 5 days on beautiful Cortes Island, BC and begin to learn why people develop chronic muscle pain, inflexibility and limited movement. If you have “tried everything” for your back, neck, shoulder or hip pain, and have only experienced short term relief, come learn how to achieve long term pain relief and improved muscular function – on your own – whenever and wherever you need it. This retreat is open to the public. No previous knowledge of Hanna Somatics is required. Learn the hands-on clinical methods of Thomas Hanna, Ph.D. to help people regain freedom of movement and eliminate sensory motor amnesia and chronic muscle pain and dysfunction. SEMESTER ONE - November 16 - Dec. 4, 2015 - Ocean Grove, Victoria, Australia - contact Martha directly if you are interested. Acceptance requires participation in the SEC Level One training, as well as an interview and application. Train for More Than the Gym - with Somatics! And now we’re suffering. Our bodies are suffering with lifestyle diseases, our minds are stressed, our spirits are confused. And our primitive, habitual responses just aren’t working.What we need is a practice, not just to alleviate our suffering, but to live the beautiful adventure we call life. Movement is probably the most important element in the adventure of Life. Human beings learn through movement; it is in our nature as self-learners of the highest order. We have adapted over time because of the ability of our cortex to do one thing: LEARN. The question is, what is important to learn and adapt to and what is potentially harmful? How many people realize that learning how to relax and recover is a critically important aspect of good health? Stress resilience is a skill. I consider Hanna Somatic Exercises a critical part of one's daily practice. Our birthright as human beings is to move easily and effortlessly, yet it takes practice and skill. Learning to prepare yourself to move with intention and voluntary control can spell the difference between "successful" aging and the traditional idea of aging: inevitable decrepitude, pain, a cane and a slow demise. What we are missing is the understanding that every part of the human body is interconnected. We are not "a knee," "a hip," "my tight psoas," or "that painful IT band." We are a system that moves in patterns, as an integrated whole. If one part of the system is out of balance, it causes an imbalance throughout the entire system. This system we call our "body" is efficient in the best of times, and completely out of control in the worst of times when, as we adapt to stress, we forget what it feels like to move and sense as we did when we were children. Somatic Exercises recreate the basic movements of bending, reaching, twisting, side bending and extending - the non-negotiable basics of all movement that came so easily to all of us long ago. They remind our brain who is in control! Tomorrow in Astoria, NY I will lead a Somatic Exercise Coach Training for a group of fitness trainers at the Matrix Fitness Center. It will be the first such training of personal fitness trainers whose goal it is to learn more about how Somatic awareness, the first step to any movement practice, can positively shift the course of one's training regime, whether the goal is to lift weights, play tennis, do yoga, dance, train for a marathon, or simply walk without pain. A somatic perspective is long overdue in the fitness arena. Many people don't feel as if they've gotten anything out of their workout if they aren't hurting; somehow, they say, they "just don't feel anything." The belief in "no pain, no gain" is the quick road to misery and a short-lived athletic career. There is a more intelligent way to approach movement - one that the trainers tomorrow will begin to experience: Less is more and slow is fast when it comes to learning how to move well. Last week I returned from a two week Somatics teaching tour in Australia. Thank you, Jo Bentley, my Australia organizer, for bringing me back to teach the Essential Somatics® Somatic Exercise Coach Training (SEC) and being a fantastic host. Thank you as well to Mick Betteridge and Philippa Howard in Melbourne for hosting a training there. As many of you know, I travel internationally teaching Hanna Somatics. Plane travel is part and parcel of my job. In order to lessen the negative effects of sitting stationary for hours in a cramped airplane seat I came up with a few somatic movements during my flight to Australia. I arrived in Australia feeling relaxed and considerably less stiff than on previous flights. For all you travelers out there - check this video out and let me know how it goes! 2014 has been and continues to be a very busy year for Essential Somatics as I travel to teach both the Somatic Exercise Coach Level One training and the Clinical Somatic Education professional certification program. Martha will also have a limited number of spots available for private clinical sessions during her visit to Australia. Please contact Martha directly to set up your clinical session. This training is open to movement professionals, body-workers, athletic/fitness trainers, Yoga, NIA and Pilates teachers and medical professionals and others outside the movement profession who want to learn to use Somatic Exercises to help others. This training is open to only to those who have successfully completely Level One of the Essential Somatics Somatic Exercise Coach Training. Bring Martha and the Essential Somatics Somatic Exercise Coach Training to your area! Training dates are available for Spring 2015. Contact Martha directly for information about how to host a training, public workshops or on-site clinical session days for those in your area seeking a long term solution to chronic muscle pain and limited movement.